This small gull is an inhabitant of the high Arctic. It nests in small colonies on the coast, dispersing along the shore and out to islands, and winters at sea at the edge of the pack ice. 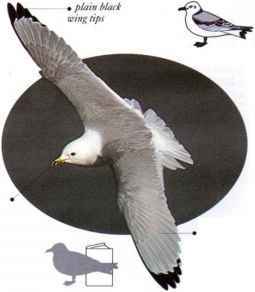 When seen in the air, it can be identified by the gray undersides of its wings and by the tapering shape of the tail. 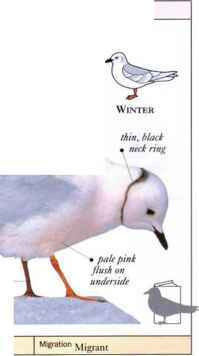 Ross' Gull feeds by swooping to take food from the surface or makes very shallow surface dives after small fish or crustaceans, and sometimes walks on mudflats to pick up small invertebrates. • DISTRIBUTION Breeds in N. Alaska, N. Canada, Greenland, and N. Siberia. Winters on Arctic, N. Atlantic, and N. Pacific Oceans.